Fine art photography, fine art black and white photography and fine wall art photography by Thomas Finkler. 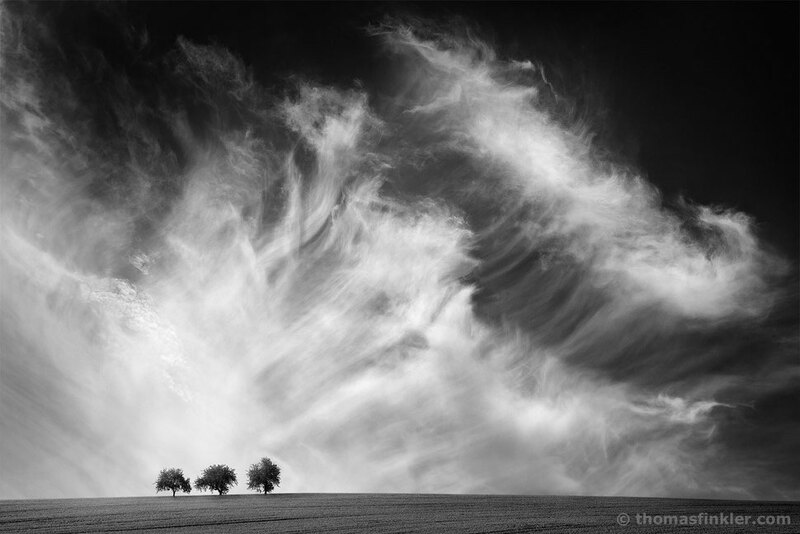 Thomas Finkler photography is a multi award winning and internationally published fine art photographer and photo artist based near nuremberg, germany, bavaria. He is specialized in minimal nature and minimal landscape photography with the favorite subject trees. The fascinating and sometimes even spectacular fine art photography, fine art black and white photography and fine wall art photography series present the photo categories cloudscape and trees, nature, landscape, abstract forest, blurry trees, abstract nature and composite. 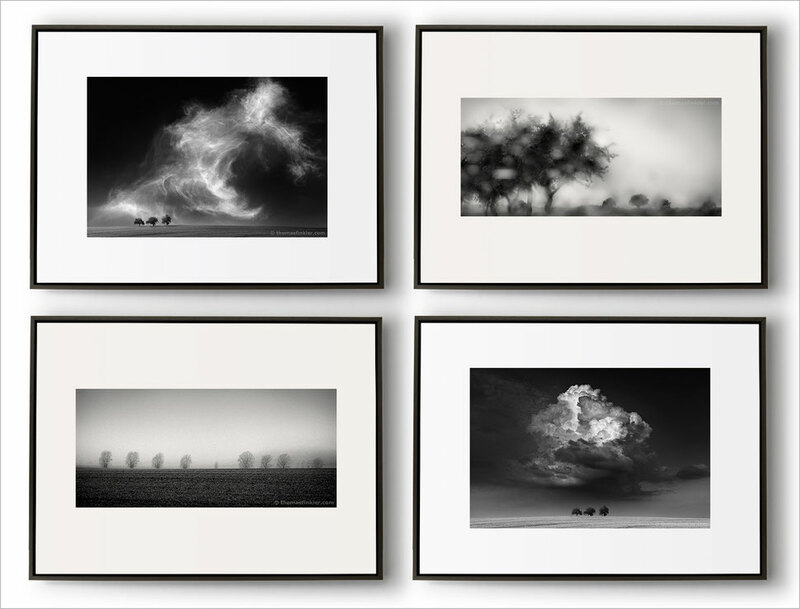 Thomas Finkler is mostly known for his stunning award winning fine art black & white photography series "dramatic skies" with clouds and cloudscapes staged in a minimal landscape: 3 trees under the dramatic sky – art photography and photographic art with a vision. While watching the interplay of light and shade through the seasons he creates most beautiful, amazing and poetic minimal fine art nature and landscape photography with trees. Many photos and all series are created both in monochrome and in color. Fine art photography prints and black and white photography fine art prints are available for purchase in a range of sizes and specifications. Buy wall art photography, wall art black and white photography and framed wall art for your home, living room and office. Fine art photography, fine art black and white photography, nature and landscape photography, framed limited edition prints and limited edition fine art prints for sale: see fine art prints | framed artwork. NEW OFFER: square framed minimalist wall art prints, see framed prints | circle and square. See also the personal favorites, the artist's selection and vision of best photographic art from the gallery sections. 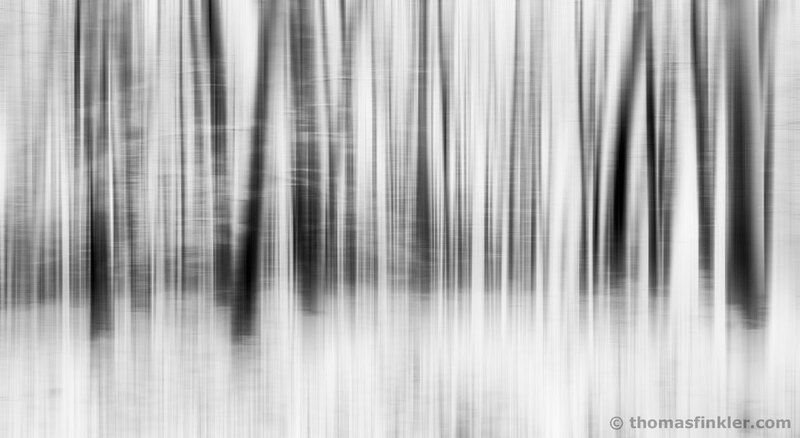 Significantly influenced by twenty years of professional experience as a graphic designer and post-processing expert Thomas Finkler creates and "designs" his own personal vision in fine art photography as professional photo artist: see photography | graphic design. 3 frame colors – white, black and natural wood – available for purchase. At the bottom of the page two images of art photography and photographic art in black & white feature the frame colors side by side at a glance. Thank you so much for stopping by – Thomas Finkler. Monochrome art photography of the week: "Up in the air ". Title: "Up in the air ", fine art black and white landscape photography, black wooden frame, limited edition print. NEW art photography series: Square framed monochrome prints for sale. Buy square black and white framed prints. Minimal wall art decorations and minimalist decor for your home, living room, dining room, bedroom or office. 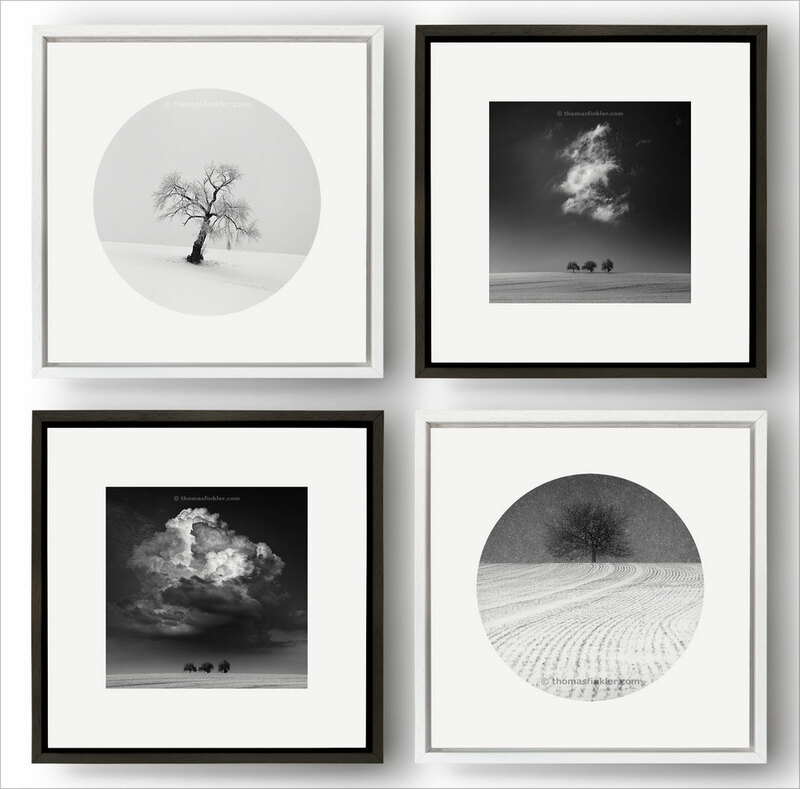 Buy square framed monochrome art prints, square black and white framed prints for sale. Gallery monochrome "circle and square"
Framed photographs and fine art photography prints with white wooden frame for sale. Buy original and affordable art, all limited editions, signed and numbered by Thomas Finkler photography; 4 available frame sizes, examples show photos with high quality wooden frames in white with shadow gap. Buy framed photographic prints and fine art photography in black & white with black wooden frames. Original and affordable black and white photography for sale, all limited editions, signed and numbered by the artist; examples show pictures with frame size 80 x 60 cm and high quality black wooden frames with shadow gap. Framed photography and fine art photography prints with natural wood frames and black wooden frames for sale. Buy fine art photography and photography art; examples present black and white photos with the frame size 50 x 35 cm, numbered, titled, dated and signed by the artist; high quality natural wood frames and black wooden frames with shadow gap. 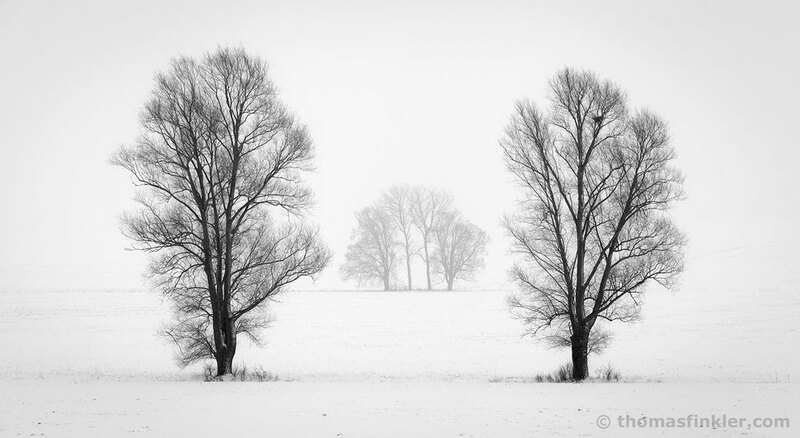 The personal favorites by fine art photographer Thomas Finkler – photography with a vision. 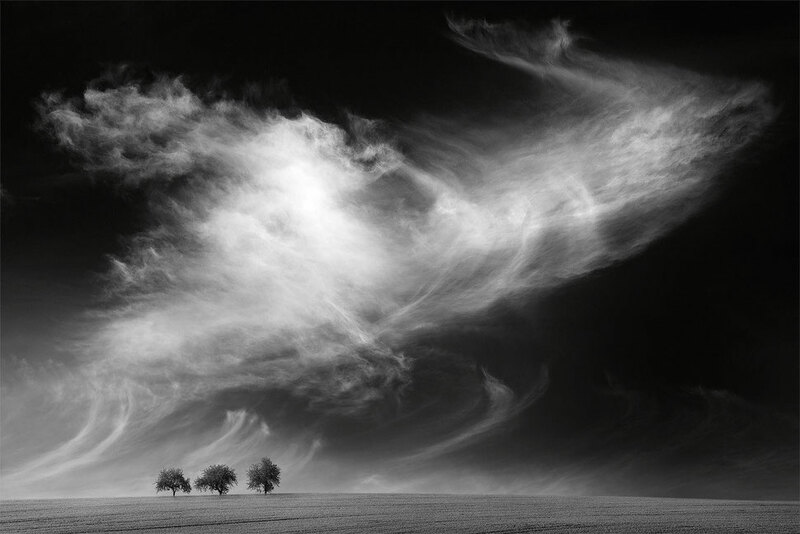 Stunning and fascinating photos with a personal vision by professional photo artist Thomas Finkler. The favorites in fine art nature and landscape photography, fine art black and white photography and minimal fine art photography. Sorted by series – in monochrome and color – as presented in the gallery sections. The photos below show 12 selected fine art photography and fine art black and white photography images from the gallery sections. Gallery monochrome "trees and landscape"
Buy art photography and black & white photographic art. Framed fine art prints for sale, all signed and numbered by the artist. 3 picture frame colors in various frame sizes for purchase. Framed black & white photos (see above) show the white, black and natural wood frames with shadow gap side by side for easy comparison; from the series "franconian tranquility". Black & white art photography and photographic art for sale. Buy framed wall art prints, all limited editions. 3 photo frame colors in various frame sizes available. Framed photographs (see above) present the white, black and natural wood frames with shadow gap side by side for easy comparison; from the series "trees and landscape". Enjoy your inspiration for modern and contemporary monochrome photography wall art, photographic art and art photography in black & white. Perfectly suitable as home accessories for new home decor and decorating ideas - feel free to visit the website gallery sections with the 6 photography art series. The frame sizes and the frame shape fit in perfectly with any wall for your home, living room, dining room, bedroom, kitchen, bathroom or office – or just place the artwork on your sideboard, shelf or bookcase. Limited edition fine art photography prints in black & white or color – signed by Thomas Finkler – are also the perfect gift for a birthday, for good friends, at christmas and for many other occasions.